Hello everyone! Im back for another unboxing/ first impressions on my FIRST ever Kikki-K! I'll be discussing my opinions on everything from design, cover, textures and so on. First thing I have to mention though is that I came onto Kikki-K at a great time because all of their beautiful planners have come on sale when I was in the market for one. Since then, it has been difficult for a few people to find an organizer from this collection without paying quite a hefty price from a second hand seller. I suggest if you are reading this as I post this, go snag one up because this beautiful collection is not be around for long! 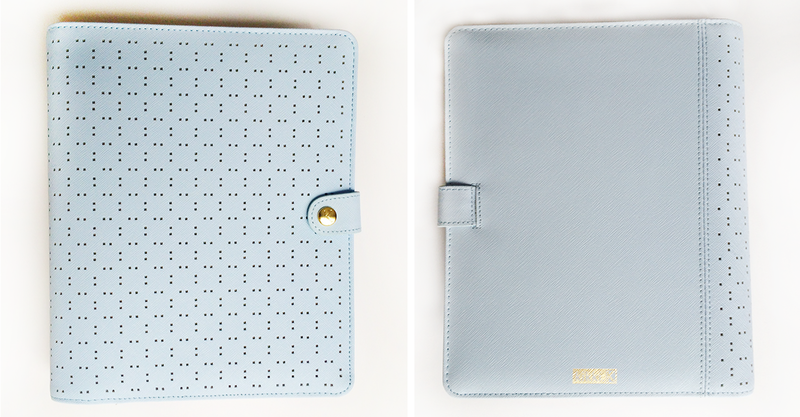 I purchased this Ice Blue Perforated planner in the size "large" which is an a5 compatible organizer, which means the inserts in a Kikki-K can be used for other A5 organizers, such as the well-known Filofax. I did order through the US site to purchase, but it is common for exclusive designs to come out for different countries, such as the red design currently available for Hong Kong and Singapore in light of the New Year, so check other countries if you are curious or in the market for a different design. My organizer shipped from Singapore on Thursday and arrived at my door on Monday morning. For reference, I live on the west coast of the USA, so that is AMAZING. One thing I do have to mention though is how terrible tracking is. Do not even bother using tracking because it is completely inaccurate most of the time. Needless to say though, I was pleasantly surprised seeing my DHL mailman with my rather large package! As I opened my box, I saw that there was quite a lot of padding so I did not have to worry about the corners of my box becoming dented in transit. Once I opened its container box, I was blown away. +++I want to point out that in my youtube video I said that the stitching was 100%, but little did I know there was a loose string where I'm assuming the under-thread tore, right underneath the larger notepad in the back, but all I did was snip it off and it was okay. The Kikki-K is about 1-1.5 inches wider than my Dokibook (that was a nice surprise) and the rings were also rather large. All my of my rings came tight and there wasn't any scratching on either the clasp or the rings. The condition was over all superb in condition. The design of the organizer is, in my opinion, stunning. I was definitely uneasy about the perforations on the front being a catalyst for grime but seeing it in person, I do not think that will be the case. 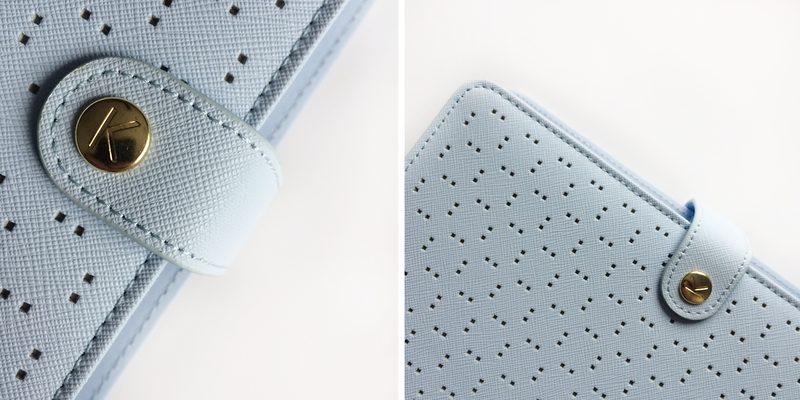 The color is very similar to a light sky blue and the leather texture is that of (or similar to) Saffiano leather. The clasp is long enough to stuff quite a bit in the planner, but not long enough that it looks quite lopsided in comparison to the entirety of the organizer (much improvement to my Dokibook). Inside the binder, you will see two small notepads slipped into some business card sized slits. I do not mind this design as much as others, but I can see the practicality of it in the future being a struggle to maintain. I am either going to have to trim down some of my current notepads or go on the hunt for some. Definitely not looking forward to that! Aside from that, I do enjoy the larger bottom two pockets, which allow for quite a bit of storage. The secretarial pocket in the back will also come into use for receipts and such. There are 7 cardstock dividers included in this planner, which I love! It is always nice to have extra dividers because I always end up wanting to log something new in the future. Since they are not laminated though, they bend easily, and HAVE bent easily since I have playing around with it. I will either be laminating them or replacing them with some custom reinforced dividers of my own, since I don't see these lasting long (I am quite rough with my planners). The paper quality is also quite thin in my opinion. I assume it is around a 20lb paper, so I'm going to guess anything aside from a ballpoint pen will bleed through. I tend to use pretty heavy inks, so I don't see this working for me on a daily basis, although I will probably use some note paper for any detailed information I need to write down. I appreciate that the monthly calendar is left blank so that I may be able to use it whenever I change my mind, as well. Also, there is no weekly calendar in this organizer, which may bum quite a bit of people out, considering the majority of people use these planners for weekly purposes, but this is not an issue for me considering I make my own inserts anyway. Overall, I think this planner is a great buy! 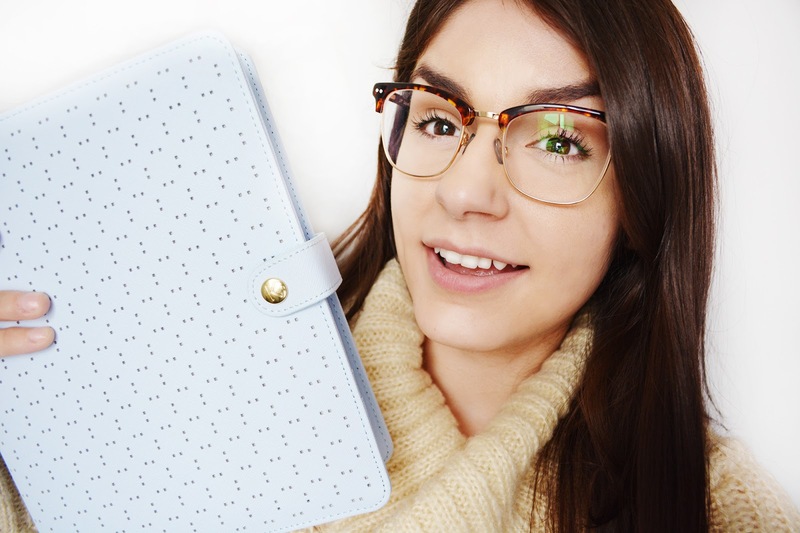 The quality of the organizer is amazing, despite my issues with the paper and the stitching on the back... Would I buy this planner at full price? Probably not. I will most likely wait until there is another sale on a planner I love or take advantage of any coupons being handed around. Feel free to leave me any questions or comments below, thank you! Hello I was wondering if you have to pay some charges for import the kikki k planner to the USA?